How to survive the Death of SEO. After SEO’s terminal coma in 2009 we carefully watched how marketers, advertisers and corporations coped with their loss. Some moved to Social Media Optimization or Social Content Optimization while others moved towards ‘community’ management which is interesting as Facebook, Twitter and LinkedIn maimed independent communities before we started our SEO death watch. Community spaces have always been one of the best marketing investments any company could make by creating a space for people to share experiences, content, expertise and stories. Done well the community spaces were like a very cool house party where the host would decorate and offer the best drinks and finger foods to set the mood and the party goers would create the buzz. A great host couldn’t lose and at the next party there would be more people than space. Some companies, like envious hosts, tried to copy successful communities but missed the ‘intangible’ values needed to make a party or a community successful–freedom and inspiration. Community by design rarely succeeds for one simple reason, it is meant to benefit the host rather than the attendee. Communities are after all software applications and the ability to motivate people to create content by typing, editing and tagging is a difficult task. Design and venture capital is critcal but luck may be more important. Did the SEO Eco-System Kill the Party? The old SEO ‘eco-system’ included advertising agencies, SEO services consultants and various other brokers that re-intermediated internet transactions and profited handsomely from their ability to stand between buyers and sellers. Watching them adjust to the rise of ‘Social Media’ may help us determine how to align our products to people with content in this brave new world where people flit between Social Media software applications according to their own needs without heeding marketing messages or advertisers, old media or new. Risk is a big problem for corporations who plan their work and work their plan and up until recently the ‘myth’ was that Social Media was a risk and mis-understood by corporate executives though in early 2009 marketing and advertising budgets were moving to Social Media faster than Amazon could acquire web sites to protect their sales volumes and SEO assets. Diaper.com–How Low can SEO Go? Diaper.com is Amazon’s latest acquisition, is it a sign of the times? It is interesting to note that diapers appear to be sold on Diaper.com rather than the diaper manufacturers and re-intermediation is profitable despite the internet myth to the contrary. We look forward to seeing if community by design will fare better than SEO though our experience is that it is difficult to influence the value communities place on content. This challenge is very clearly illustrated by watching how people change the words they use to describe questions or find answers while using search engines. Even if your company built a ‘perfect’ website that described a perfect product the search engines would probably no longer rank your site highly on their SERP or search engine results pages after 90 days because the words used in search engines would no longer correspond to the content on your web site. SEO or search engine optimization and the mechanics of determining which sites rank highly would take over and drop the ranking of your site, if it ranked highly at all. Twitter’s Resonance model is a bright light in the blight of internet spam and communities over-run by packs of network marketers re-selling Amazon product because it is resistant to spam and depends on trust even if temporary communities are created by followers or ‘likes’. The key element to resonance is its temporary nature and that a follower or like today is closely linked to a Tweet or content. The same people won’t have the same influence if the content changes tomorrow which means spam doesn’t stick. Temporary communities mean that community by design doesn’t pay which is difficult for corporations and marketers alike but apparently good for community members as evidenced by Twitter’s meteoric global rise on the back of mobile phone technology. Mobile phones present an interesting opportunity and threat to Social Media platforms and marketers alike as users won’t stand for hundreds of SEO results so we expect SEO to decrease in value as more people chose mobile phones as their interent and Social Media interface of choice. Communities may also be smaller by necessity as it is difficult to view large amounts of content and follow many people on a mobile interface. Crowd sourcing and X-prizes have been a boon to marketers and have leveraged the global reach of the internet to create huge values for corporate sponsors and stimulated future investments in the hundreds of millions of dollars by comporations like GE, CISCO, Nokia and others. Community spaces created for innovation have been successful though they have not been communities by design. We are currently exploring the intersection of Resonance, Innovation and Communities and welcome inquiries from innovators who wish to explore the space. I took another look at one very interesting Twitter feed yesterday with our SpeedSynch Resonance Maps and noticed the posts about Nokia, Chevron and ExOfficio and an interesting pattern emerged. These companies treat Social Media as a pool of stories which is different than most executives who treat Social Media as a source of answers and questions. SpeedSynch and Resonance is about stories. SEO and search engine optimization is about questions and answers. Trust goes to Social Media becasue of Story Resonance. Trust leaves SEO because the answer is the same to any question–a sponsor’s product. It is hard to explain this without images and when you are ready contact us to set up a Skype webinar which may answer the questions that you may have and stimulate others. Global sourcing and Social Media marketing helps most people find most products, fast. The concept behind Prediction Marketing is simple, use forward facing indicators to determine where customers are going. We do this by understanding ‘resonance’ or what is on the mind or people or corporations or organizations based on Social Media conversations and content. I don’t know Brent D. Payne but here is his Twitter Resonance Map created with our SpeedSynch internet marketing software. I found Brent D. Payne’s Twitter site after looking at Market Sentinal UK firm that offers brand perception analysis. 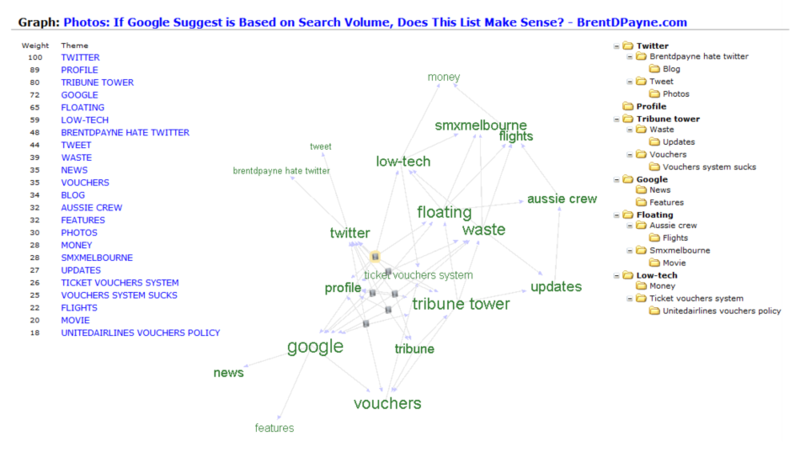 The link between Resonance or what is ‘top of mind’ and Prediction Marketing is significant and may be a stronger indicator of future buying demand than Search Engine analysis because Tweets often contain the context of the question or highlight the value required by people who search for information or products. We look to Persona Behaviours to indicate future buying behaviours and we build Persona quickly with SpeedSynch Resonance Maps. Marketers have a hard time resisting the temptation of taking past sales and marketing analysis to guess at future buying behaviours of their customers because it is easy, the numbers can be found quickly from point-of-sales systems, sales reports and colourful analytics dashboard views. Everything is clearer after one or two weeks but there is a question that historical data won’t answer–what will we sell tomorrow. To determine a reasonable answer to this critical question it is important to find out what is happening with our customers or rather their ‘common behaviours’ today. We help our customers do this by looking at Persona Behaviours. Understanding how customer behaviours are changing allows us to tune our customer demand models and adjust our market offers to incent or dis-incent behaviours by adjusting our advertising, pricing and Social Media conversations in a synchronized fashion. Understanding customer Persona Behaviours also helps us synchronize our content across media channels and align our media spend according to the Persoan Behaviour trends that we find in Social Media and our other market information sources. If we wanted to get Brent D. Payne to the Market Sentinal site we would have to adjust content somewhere on the Market Sentinal web site so that it resonates to what he needs and looking at Twitter gives us an indicator of how this may be done. Sending the Market Sentinal ‘product’ to Brent D. Payne requires that the content be ‘pushed’ out via advertising or SEO in a fashion and in a channel where he would see it or be made aware of it indirectly, perhaps by members of the communities that he frequents. Now if we assume that Brent D. Payne has managed to get to the Market Sentinal web site or Market Sentinal product information was delivered to him then we have a significant opportunity. The ability to convert prospective customers to paying customers requires the use of learning. Both Brent D. Payne and Market Sentinal must quickly learn about the other and find the fastest way to deliver value according to the questions or answers that are ‘top of mind’. Indeed unless learning happens quickly then the resources expended to get Brent D. Payne to a web site and the time that he invests there is practially useless. Learning is what amplifies the success of Resonance and learning is often overlooked when creating ‘landing pages’ or content that is delivered to people when they are attracted to web or Social media sites. Contact us to see how SpeedSynch Resonance Maps get People to Products, Products to People and facilitate Fast Learning. Most Social Media marketers tend to promote the idea that ‘shaping’ or influencing conversations leads to marketing success, though in our experience the link between ‘good conversations’ and marketing success is hopeful at best as you can see from your own experience. Conversations are about talkers or posters in the Social Media community platform spaces where roughly twenty people ‘listen’ or lurk in the background for everyone that ‘talks’ or posts. They rest of the people in a Social Media community listen or watch what is going on and may or may not find the conversation or other content in the place or space that they visit. Since late 2008 more people have started searching for things or information they need in Social Media communities rather than Search Engines and the trend to listening to ‘people rather than machines’ has accelerated since then with the cooperation of Marketers and Advertisers who have begun to shift most of their marketing budgets to Social Media platforms and away from Search Engines Pay-Per-Click or Organic SEO and traditional Media sources. The shift of marketing budgets has also changed success measures as Social Media communities are not the same and range in value provided by software suppliers that include Facebook, LinkedIn, MySpace and Twitter among others. Each platform provides slightly different value to members and advertisers alike, some facilitate commercial transactions, others social interactions, while others are better at getting people to the information or relationships that they need in order to choose what to buy when. Most of the new success measures focus on ‘talkers’ or people that interact with the Social Media platforms rather than the relationships of People, Content and Process or work. Social Media, unlike corporate sites or blogs typically contains ‘advertising or marketing messages’ imbedded in content or conversations. The implication is that ‘Social Media’ is not ‘corrupt’ and people provide their own opinions and perspectives about products. However in practice it is easy to see where manufacturers, re-sellers or service providers ‘stuff’ blogs and Social Media spaces with ‘favourable opinions’. Opinion ‘stuffing’ is similar to and often related to Search Engine Optimization or SEO keyword stuffing where people or companies try to ‘control’ keywords typed into search engines and direct the folks who type those word combinations to their sites regardless of the suitability or affinity or resonance of the web site content and the person who is looking for something. Social Media conversations are used as a ‘gentle way’ of accomplishing the same thing as ‘keyword stuffing’, conversations are started or amplified so that the conversation sponsor benefits by inflencing people in the Social Media space. The idea that conversations are friendly and trump advertising is a romantic notion at best as any advertisers knows how to bend, shape and twist converstations to highlight their products and services. Posing as a happy customers or ‘leading’ a conversation like a skilled courtroom barrister or lawyer is also not very honest though it happens quite often and many Social Media companies explicitly offer services that promise successful results using similar techniques. Twitter on the other hand actually prevents this type of behaviour or promotion or marketing from being very effective since the number of lurkers or voyeurs outnumber the ‘conversationalists’ or bloggers by at least 10 to 1. With Twitter the ‘promotional’ content, unless it is a paid promotion, dies as there are not enough real customers repeating or re-Tweeting. If Twitter doesn’t provide and advantage to marketers who hope to shape or influence conversations then what? Consider the opportunity to ‘amplify’ what customers are telling you and indeed Twitter will only allow paid promotions of Tweets or posts that have been posted previously on company Twitter streams and not specially crafted posts or Tweets. 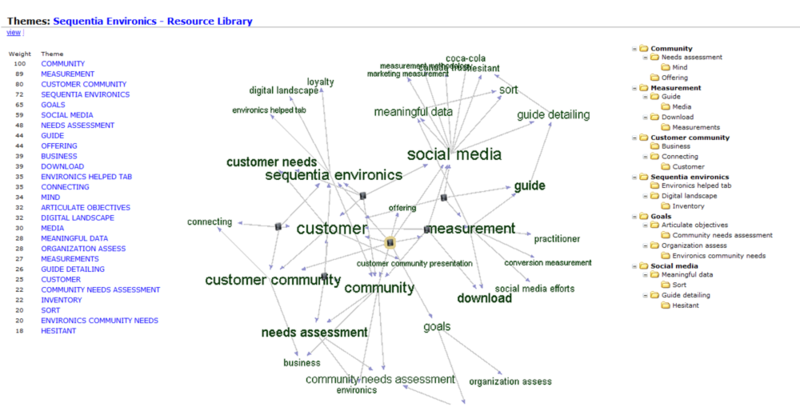 Call us to see how our SpeedSynch Resonance Maps measure what is important to your customers and help you amplify what they need. Competitive analysis is typically backward facing as it relies on measures and stories that happen in the past, but there are ways of making competitive analysis predictive. Predictive measures are those that help you anticipate and exploit future events, much easier said than done, and very much on the minds of executives mostly as a way to mitigate risk. However, there are simple ways that it is possible to identify future opportunities and the measures that indicate where and when they might happen. While comparing these two measures is very simple it is the detail that provide us with the greatest opportunity to understand what happened or how we may adjust along our path towards our objectives. The detail in measures is provided by three significant relationships. Understanding the relationships of people, content and process related to each goal allows us to understand when things change with our customers and prospects. Quickly adjusting to market changes then permit our estimates and goals to be tuned as we go to market and help shape future options for our customers and prospects. Measuring carefully or rather letting your customers and prospects adjust your measures and future goals provides a unique element to your competitive analysis, it becomes predictive. We typically skip the market analysis part of this relationship because we prefer to take the customer or prospect perspectives of measures and content requirements. This approach is simple and employs the concept of Resonance which has recently been championed by Twitter in their Advertising model. Resonance is a simple concept as employed by Twitter, if content is popular it is Tweeted and Re-Tweeted. If content stops being popular then it ‘dies’. Essentially Twitter is a ‘market space’ where the Twitter community ‘votes’ and where it is easy to see if and when members of the Twitter community ‘spam’. One of the significant impediments to adding a predictive element to competitive analysis is spam, simply because spam distorts analysis by placing artificial importance to products or people which is difficult, if not impossible, to compensate with traditional or social media analytics tools. We use SpeedSynch Resonance Maps to augment competitive analysis and provide a predictive value based on persona behaviour. Contact us if adding a predictive element to your competitive analysis may help you.